How would you build a machine learning algorithm to solve the following types of problems? Predict which medal athletes will win in the olympics. Predict how a shoe will fit a foot (too small, perfect, too big). Predict how many stars a critic will rate a movie. If you reach into your typical toolkit, you’ll probably either reach for regression or multiclass classification. For regression, maybe you treat the number of stars (1-5) in the movie critic question as your target, and you train a model using mean squared error as your loss function. For multiclass classification, maybe you treat bronze, silver, and gold medals as three separate classes and train a model with cross entropy loss. While these approaches can work, they ignore a fundamental aspect of the prediction targets in the proposed problems: the targets have ordinal relationships to each other. There is a larger difference between bronze and gold than silver and gold. Similarly, from the point of view of the model that we would like to build, our wrong predictions should have ordinal relationships. If we predict that a piece of clothing will be too big on a customer and we get our prediction wrong, then it’s more likely that the clothing fit the customer than that we got things entirely wrong sucht that the clothing was too small. This class of problems is called ordinal regression. While commonly seen in industry, the tooling and education around using these models is somewhat lacking. As well, the tools that do exist are rather inflexible in that one is limited in the types of models and techniques that can be used. I have a somewhat idealistic goal of taking all of the bespoke machine learning methods for which people used to solve via linear models and manually calculated gradients and instead rewrite these models using a deep learning framework with custom loss functions optimizable by stochastic gradient descent (SGD). This would allow people to move beyond linear models (to, say, deep neural networks) and enjoy all of the benefits of SGD (ADAM, batch norm, scale, etc…). As well, I’d like to do this all in a scikit-learn-compatible way because I just love their API. To illustrate my point, let’s look at the only scikit-learn-compatible library I could find that fits ordinal regression models, mord. Don’t get me wrong, this library is great and quick and created by a verifiable expert in ordinal regression models. However, all of the models available are linear models with L2 regularization. What if I want to throw a deep learning model in there? What if I want to induce sparsity with LASSO? I would have to manually calculate the objective functions and associated gradients and create a brand new class in the library. 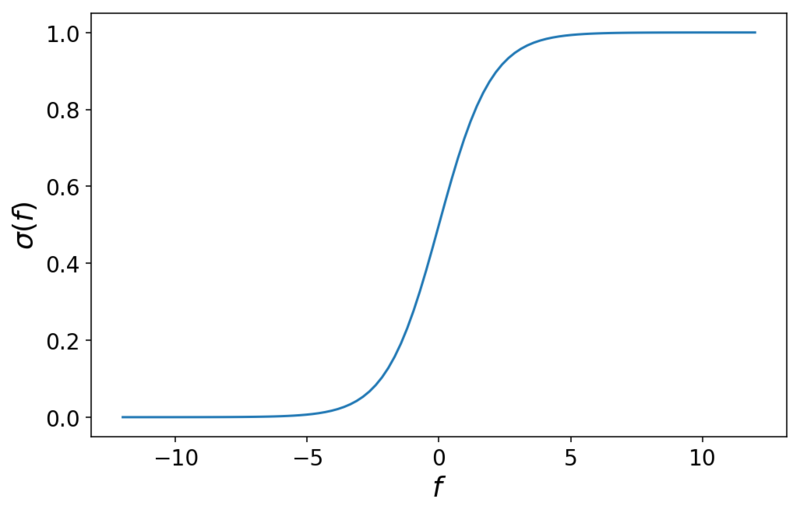 If I can instead suitably define a loss function compatible with ordinal regression, then I can use any of the deep learning frameworks that use autodifferentiation to optimize whatever model I want. And I’d like to be able to scale this to large data, which rules out the stan and pymc3 implementations. 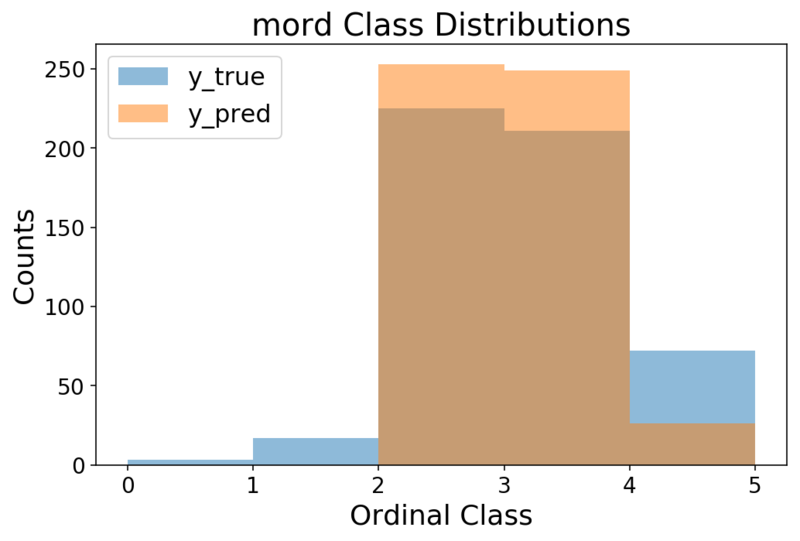 So that’s what I did, and I created a small library spacecutter to implement ordinal regression models in PyTorch. 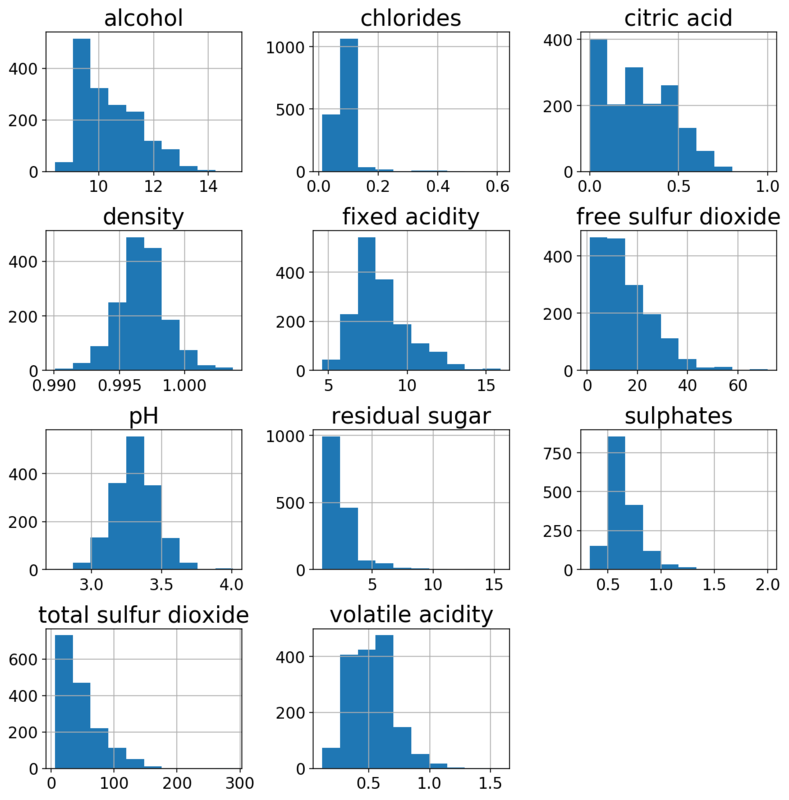 In this post, I will explain how ordinal regression works, show how I impemented the model in PyTorch, wrap the model with skorch to turn it into a scikit-learn estimator, and then share some results on a canned dataset. There are a number of ways to solve ordinal regression problems, and I will only walk through one method in this post. I found this paper that was referenced in mord to provide a good introduction to how to solve these problems. For the technique used in this section, I referenced this paper by the author of mord, Fabian Pedregosa. Although he did not create this technique, the referenced papers were behind paywalls, so I can’t vouch for them. While I defined the cutpoints by hand above, in practice we would learn the optimal values for the cutpoints as part of our machine learning problem (which we’ll talk about in the next section). Varying the cutpoints varies the class probabilities. This can sometimes lead to unintuitive results when the cutpoints are close together such as a particular class never being the most likely class for any value of $f$. 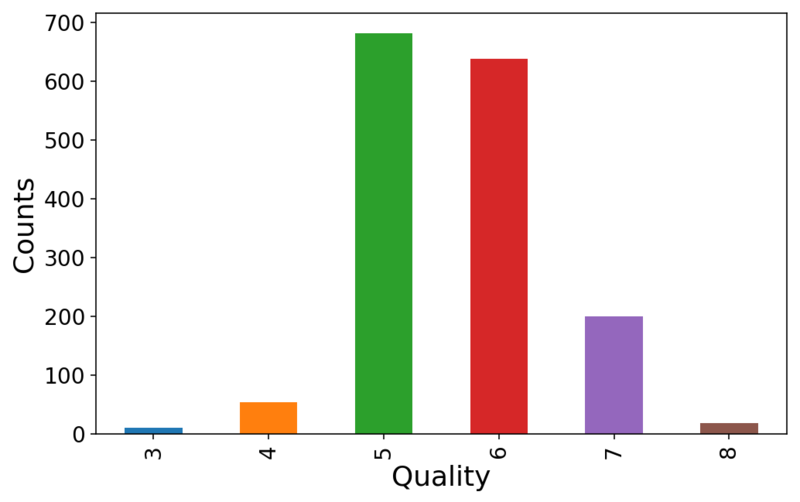 The following animation shows the class probabilities for a 5-class model as we vary the cutpoints. Now that we have our model that predicts ordinal class probabilities, it’s only a small step to learning a model. We simply need to define a loss function and minimize. 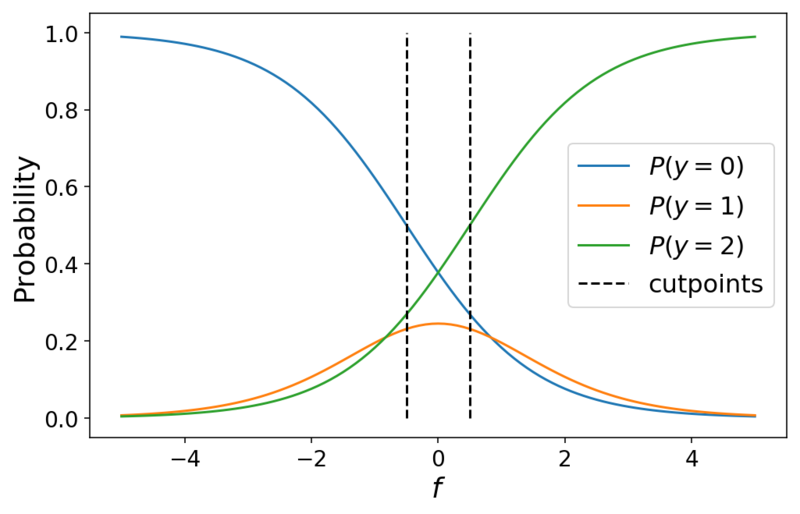 Our loss function will be the negative log likelihood which corresponds to the negative log of the class probability that we predict for whichever class is the “true” class for a particular observation. In pseudocode, imagine that we have three classes and a prediction y_pred = [0.25, 0.5, 0.25] corresponding to the predicted class probability for each of the three classes. If y_true = 1, then our loss is -log(y_pred). This is easy enough to define in PyTorch, and then all we have to do is optimize both our model and our cutpoints via Stochastic Gradient Descent (SGD). One wrinkle is that our cutpoints should be in ascending order. That is, cutpoint < cutpoint < ... cutpoint[K-1]. This is a constraint on our optimization problem which is not easily handled by SGD. My dirty hack is to clip the cutpoint values after each gradient update to ensure that they are always in ascending order. With more time, I’d like to implement a more proper solution. We create some model that generates a single, scalar prediction. Use the cumulative logistic link function to map that scalar to ordinal class probabilities. Define and minimize the negative log likelihood loss corresponding to the predictions. Ensure that the cutpoints remain in ascending order. Now, let’s walk through how to do this in spacecutter. We’ll use a wine quality dataset from the UCI repository in which each observation is a wine rated on a scale from 1-10. 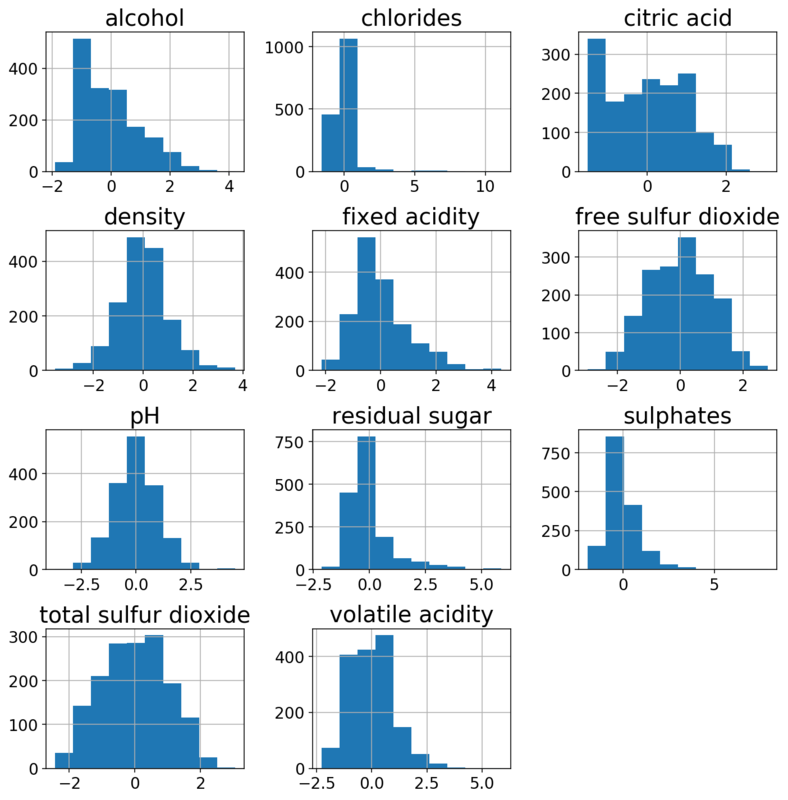 We start by downloading the dataset, inspecting some of the features, and doing some basic preprocessing of the features using the new ColumnTransformer in scikit-learn. It seems that everybody rates the wine quality somewhere between 3 and 8. We’ll map these to classes 0-5. We’ll check out the distributions of the 11 different features. Just to show off the power of the ColumnTransformer, I’ll use a StandardScaler on the more gaussian-like columns and a PowerTransformer on the other ones. The transformed features look a bit more normal. Cool, now that we have an X and y and a preprocessing transformer, we can get to training the model. Remember that the first step for ordinal regression is a model that predicts a single scalar value. I’ll create a simple two-layer neural network in PyTorch for this purpose. To train this model, we’ll use skorch which wraps our model and makes it compatible as a scikit-learn estimator. Crucially, we must pass in the CumulativeLinkLoss loss module from spacecutter. Additionally, we use a custom spacecutter callback AscensionCallback which maintains the ascending order of the cutpoints. 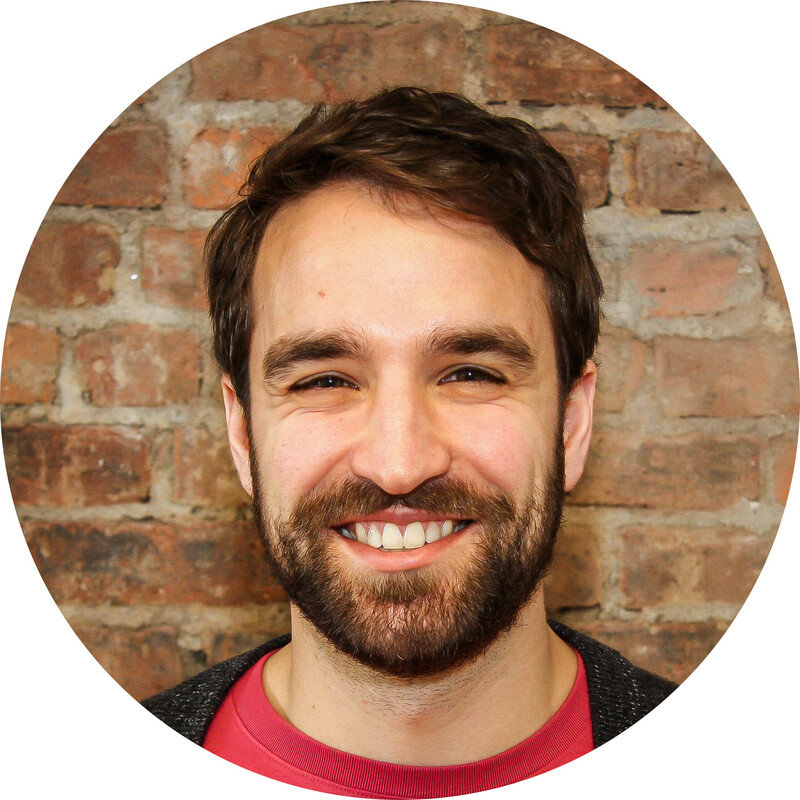 The last step is to package everything up into a scikit-learn Pipeline. Note: I have to add a small transformer to make sure that the matrices are floats (and not doubles) before they’re passed into the skorch model. Let’s use mean absolute error as our scoring critera and do a grid search across number of epochs, learning rate, and weight decay (aka ~L2 regularization). Now that we’re done our search (86 minutes later…), let’s investigate the results. 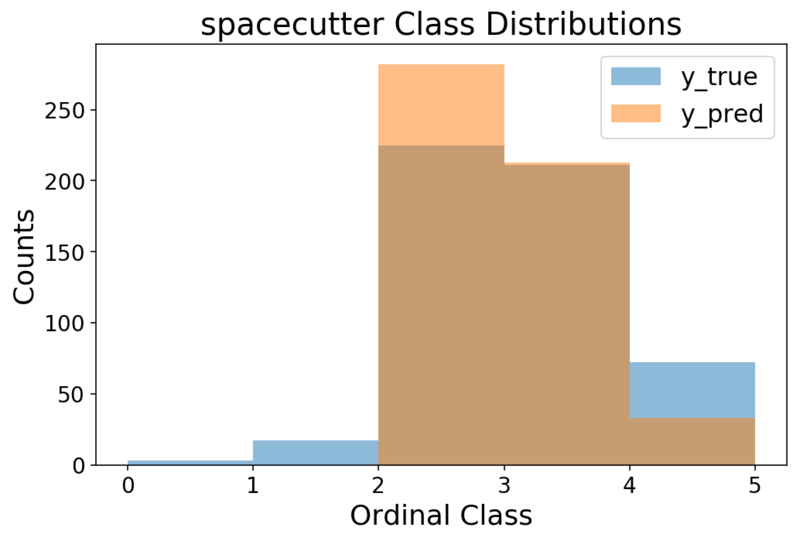 We can see that the cutpoints are reasonably separated and in ascending order. The accuracy is decent for a multiclass model, and we can see that we’re off in our rating prediction by less than 0.5 on average. Lastly, let’s do a quick check of how this compares to mord.